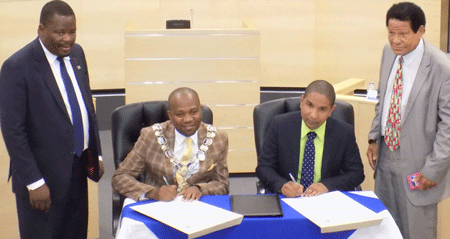 The City of Windhoek and Kingston and St. Andrew Municipal Corporation, Jamaica signed a Twinning Agreement this week at the Council Chambers, where they declared their mutual desire to develop active and meaningful relations between them. His Worship Muesse Kazapua, Mayor of the City of Windhoek said the twining agreement is a historic moment as it will be the first twining relationship, Windhoek has signed in the Caribbean Region. “We should therefore strengthen business to business linkages, encouraging stronger trade and investment in key sectors that are mutually beneficial to Windhoek and Kingston and promote investment and knowledge management around municipal infrastructure development, housing, youth development, sports and culture,” he added. He said the agreement should create and establish mutually beneficial partnership and indeed create a conducive environment for collaboration in areas identified withing the agreement and future arrangements as and when need arise. “Let us work together to building a long lasting friendship that promotes sustainable partnerships that will benefit our perspective cit citizens and promote good will between Namibian and Jamaica,” he encouraged. 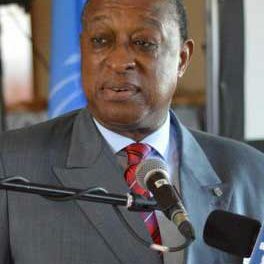 Senator Delroy Williams, Mayor of Kingston and St. Andrews Municipal Corporation said Windhoek can become a City of international prominence, within the next 20 years, with need to be pursued vigorously and Kingston can share on this and have mutual dialogue for both cities to progress in the right direction. He advised that the housing issue can also be incorporated in to the health sector, meaning, that the issue should be urgent because people are leaving in slums which is not hygienic. Areas of cooperation that the cities will be focusing on include, exchange of information abut the development of housing programmes in in line with what is desired and what is achievable, development planning in both cities, promotion of tourism, cultural exchanges and related matters and economic development including the stimulation of small business in the cities.